Black and gold decorations beautifully stand on top of counters and hang from the walls of this lavish beach vacation home in Costa Rica, giving a sense of luxury and comfort to the flat. Yet the true riches of this lovely Las Catalinas beach apartment in gorgeous Plaza Central lie in the striking full ocean views from its ample windows and many balconies, a most pleasant reminder that you are just a hundred meters from the sea. There is an unassuming elegance to the main living quarters of this Guanacaste vacation rental, with chic simplicity and coziness in its black dining table, grey sofas, and coffee table. More indulgent notes include its artful decorations, marbled kitchen countertops, and state of the art appliances. The ocean can be gazed at from throughout the room. The sea should also be the first sight you take in when you wake up in the Master Suite of this delightful flat in Las Catalinas; just draw back the curtains and rejoice view from your snug queen bed. A secondary guestroom has two single beds than can be turned into a King. Both bedrooms feature ensuite bathrooms. 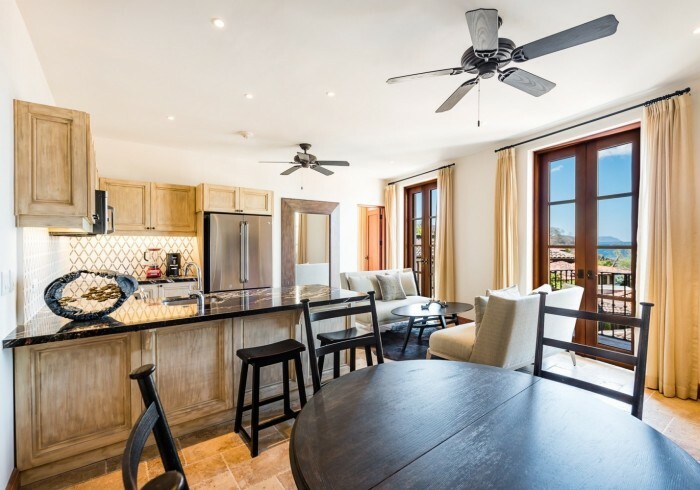 With a quartet of charming balconies and unforgettable ocean views, overlooking the beach town of Las Catalinas, yet a short walk to the beach, this Costa Rica rental home in Plaza Central accommodates up to four guests. Children are welcome.